Survey templates are a great way to get started, espcially when you don't quite know where to start. They speed up the creation of surveys by providing a starting point to work from for survey beginners or people who are new to SmartSurvey. They are also an extremely powerful tool for Enterprise level account holders as they allow you to create and share your own survey templates to your user accounts. Click the Create a Survey button. Click the Use a Survey Template link. In the Template drop-down menu, select the template you would like to use. Click the Preview button to check the survey before you select it. In the Title field, type a title for your new survey. 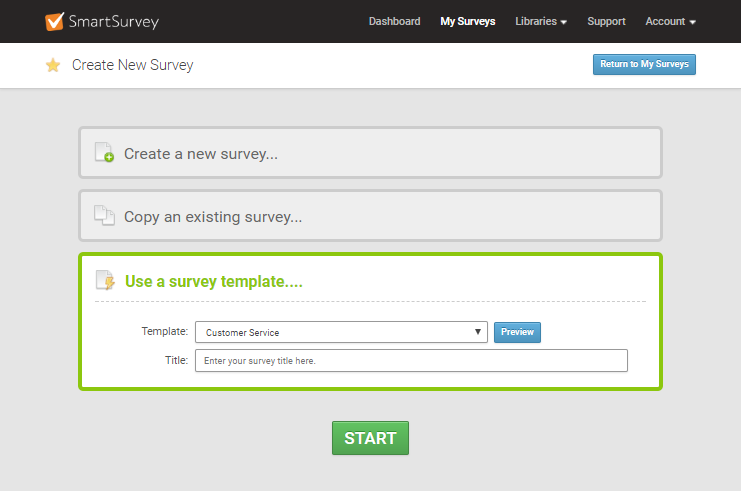 You can now use the survey editor to customise your survey. Team Survey Templates - The Enterprise account offers users the ability to create their own survey templates, which they can then share with colleagues within their organisation through the user account management. Not on the Enterprise plan? Please visit here or contact us to find out more.